Anyone who lives or walks in the woods in Arkansas in Springtime can watch the Greening of the Earth. The abundance of plant life is evident in trees, bushes, wild flowers, gardens, mosses, grasses, even some insects. As the plants inhale carbon dioxide, and exhale oxygen, the Green starts on the ground and moves upward, increasing in size, covering the grey of winter with thousands of shades and tones of green, each entity a different shade of green. During the day, the leaves put on wonderful dances as they respond to the breeze and the sunlight. The movement and the color speak to us if we take the time to listen. Sometimes we choose to ignore Mother Earth just as we do our human mothers. 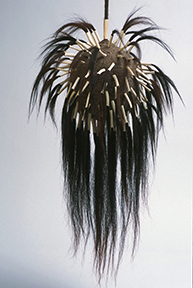 APRIL 7 - MAY 6: Thursday - Sunday: 10 a.m. - 3 p.m. / APRIL 28-29: 10 a.m. - 5 p.m.
Come watch Barbara Cade make her felted works in preparation for her solo show, Bonfire. 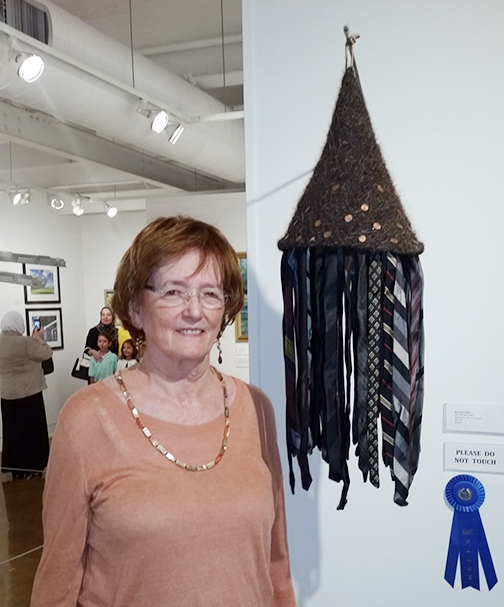 Barbara Cade with Hair Hat #4 won 1st place and a solo exhibit at the Fort Smith Regional Art Museum. “Animus River Spill” was purchased by Fort Smith Regional Art Museum following the “Transcendence” exhibit. Felting Demos: Saturday, December 3 from 10 a.m. - 4 p.m. & Sunday, December 4 from 1 - 4 p.m.
Support needy families of Hot Springs/Garland County by bringing a non-perishable food item to donate. All donations go to the Jackson House. OPEN STUDIOS: Saturday, April 30 & Sunday, May 1: 10 a.m. - 5 p.m.
Artists all over the city open their studios to the public. Come by the Blue Rock to learn about the ancient art process of wet-felting and make a little sample. 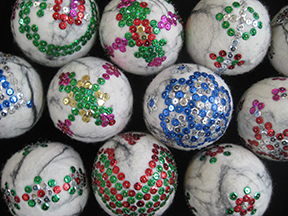 NOVEMBER 21, 2015: 9 a.m. - 5 p.m.
MAY 1 - 30, 2015: Wednesday - Sunday 10 a.m. - 4 p.m.
JULY 19 - AUGUST 15, 2014: Tuesday - Sunday 1 - 4 p.m.
Felting Workshops: 9 a.m. - 12 p.m. Call for reservations. Hours: 1 - 4 p.m.
Felting Workshops: Mornings. Call or email for reservations. HOURS: November 21, 2010 - 9 a.m. - 5 p.m. / November 22, 2010 - 1 -3 p.m. HOURS: November 21, 2009 - 9 a.m. - 5 p.m.